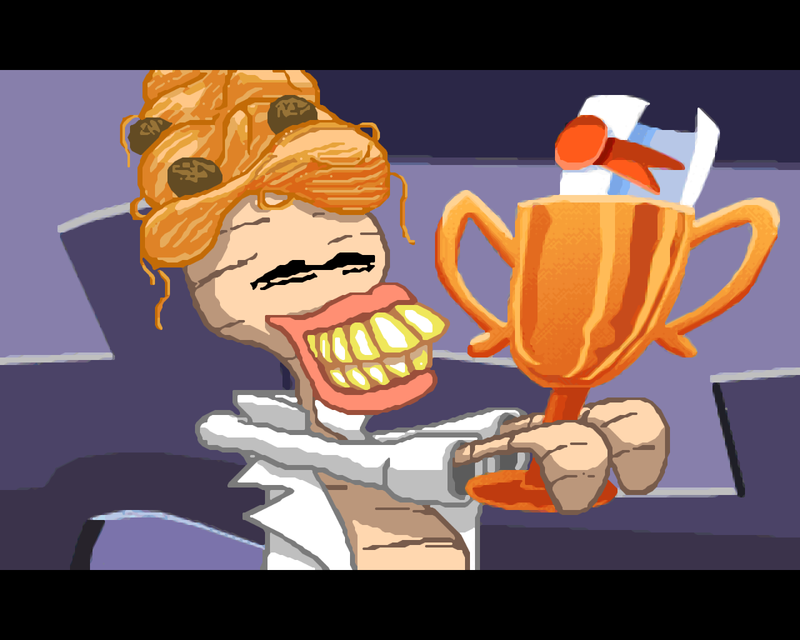 Day of the Tentacle – In my younger days, the NES version of Maniac Mansion was a favorite of mine. It was bowdlerized somewhat from the original computer version, particularly in terms of Nurse Edna’s sexually suggestive comments. 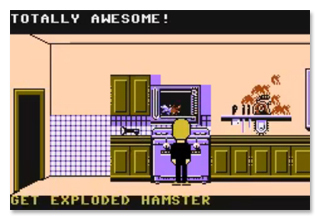 Nintendo initially missed that you could microwave a hamster, though. Anyway, the game was mostly intact even in the edited version and a lot of fun regardless, if some parts of it were pretty much impossible to solve except either with a guide or a lot of trial and error. It involved three kids breaking into a mansion to save the main character’s girlfriend, who had been kidnapped by the mad scientist Dr. Fred Edison. It’s eventually revealed (SPOILER ALERT for a game from thirty years ago) that the doctor is under the control of a sentient slimy purple meteor. 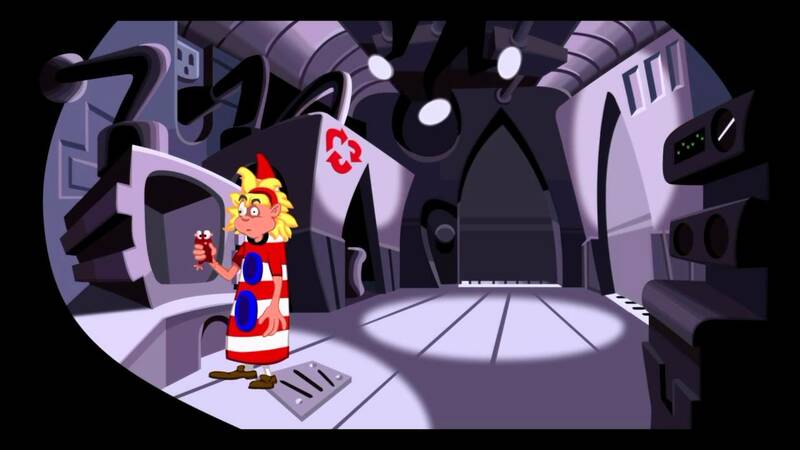 LucasArts went on to make several other point-and-click adventure games that weren’t ported to Nintendo systems, including this direct sequel, originally from 1993. It takes place five years later, or at least the beginning does, as there’s time travel involved. Radioactive sludge has caused the Purple Tentacle to mutate and decide to take over the world, and Dr. Fred’s solution is to kill both him and his green brother. The Green Tentacle manages to get a message to Bernard Bernoulli, one of the heroes of the previous game, the ingenious but awkward nerdy kid. He was actually an optional playable character in that one, but this game treats his taking part in the last adventure as canonical. None of the other earlier heroes show up, Bernard instead bringing his roommates, fat metalhead Hoagie and mildly psychotic med student Laverne. After Bernard stupidly frees both tentacles, Dr. Fred’s new plan is to send the three of them back in time to turn off the sludge-making machine. Due to a malfunction with his time machine, Hoagie ends up 200 years in the past and Laverne 200 years in the future. In the late eighteenth century, it just so happens that George Washington, Thomas Jefferson, John Hancock, Betsy Ross, and Benjamin Franklin are all staying at the inn run by Dr. Fred’s ancestor Red, and working on writing the Constitution. They’re all portrayed as comical caricatures: Washington has an obsession with chopping down cherry trees, Jefferson refuses to use his log to make a fire for the shivering Hancock, and Franklin talks with a lisp and acts like a mad scientist. 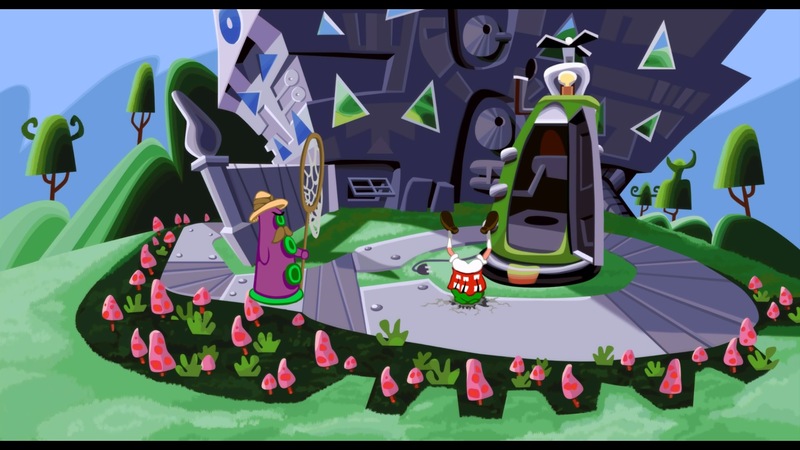 The whole style of the game is cartoonish, based largely on a Chuck Jones style of animation. All of the characters move in their own ways, and there’s even part where a cat is mistaken for a skunk a la Pepe le Pew’s would-be paramour. The version I played was the remastered one, but the style appears to be the same, just in higher resolution. In the future, the Purple Tentacle rules the world and his kind keep humans as pets. Dr. Fred confirms here that he created the Tentacles, so how there came to be more of them isn’t entirely clear. How they’re able to grow facial hair is lampshaded, but not really answered. While the machine won’t transport any more living matter without a diamond, it can be used to send objects between time periods. Changes made in the past can affect the future, and there’s a tendency for huge alterations to history being the only way to solve relatively minor problems. By the end of the game, both the Constitution and the American flag have been significantly altered. The layout of the house is basically the same in all three time periods, which is strange as it isn’t much at all like it was only five years previously. The hamster having been microwaved is considered canon, and not only has Weird Ed been through intense psychotherapy that resulted in his being a practically zombified stamp collector, but you do the same thing again. This time, though, it’s in the future, and the hamster survives. Dead Cousin Ted plays a more significant role than in his first appearance, and he’s apparently been dead even longer than we previously thought, unless that’s a different mummy in the eighteenth century. More meta-humor involves Maniac Mansion existing in-universe; you can play it on Weird Ed’s computer (I didn’t, but it’s a cool feature), and part of the plot involves Dr. Fred never having signed the contract that would have given him royalties for the use of his family in the game. As with other games of this sort, some of the puzzle solutions are pretty obvious, while others require weird logic but at least are generally funny after you’ve learned what they are. I will say it’s considerably less intense than its predecessor; you can no longer die or make a mistake that results in the game becoming unwinnable, and there isn’t the constant threat of being thrown in the dungeon. Well, except in this part, but it doesn’t last as long. This entry was posted in Cartoons, History, Humor, Monsters, Video Games and tagged benjamin franklin, bernard bernoulli, betsy ross, chuck jones, constitution, day of the tentacle, dead cousin ted edison, dr. fred edison, george washington, green tentacle, john hancock, lucasarts, maniac mansion, nurse edna edison, purple tentacle, red edison, thomas jefferson, time travel, weird ed edison. Bookmark the permalink.